Budgeting is one of those cringe worthy words that we all like to avoid. I think it’s because we associate restrictions with budgeting and who wants restrictions in our lives? But a budget is without a doubt the most vital tool for small businesses. Consider it a guideline, a scorecard or a report card for how you are doing financially as a business every month. It will help you make business decisions, and can make you a better business owner when you spend time watching the dollars regularly. Building out your budget doesn’t have to be hard or even time consuming. 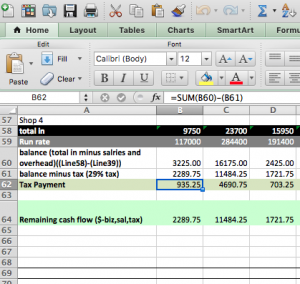 Many of you are already using some form of accounting program and we have created an excel spreadsheet that you can use or modify simply by clicking HERE. Determine your milestones so that you recognize when you pass them. We know from working with so many mobile repair shops and paintless dent repair companies that very few of you guys have any type of formal plan for your business. While it is certainly possible to just keep showing up every day, do good work and you will see growth, how do you know where you are headed and without knowing the milestones as you pass them? You will need to borrow money, your bank will want a plan. Unfortunately with growth also comes more pains such as hiring, obtaining a line of credit at the bank, equipment leasing, tax planning and so on. Every aspect of these new processes will require some form of a business plan. Having written a few of these, I can tell you it takes a very long time. A budget can help you make hard decisions quicker and easier. It is logical that purchasing equipment proven to save time will also save you money. But how do you know when you can afford to invest in new equipment or software without being able to look at your own numbers? A budget will help with that. The easiest thing is to create a Microsoft Excel spreadsheet. You can create your own or you can download our template below. On your spreadsheet, include the next twelve months going from left to right in the top columns. 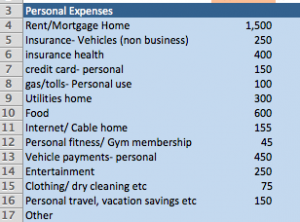 Leave room in the first column to list out each expense. Next, in the first column start labeling all of your expenses. It helps to have a couple of recent bank statements handy; you will be surprised at how many little expenses that you forget. Start with your own personal expenses. The way I like to do mine is start with the bills you personally have to pay each month, stuff like mortgage or rent, food, etc. Put every personal and non-business expense you have in there. This will give you a good idea of what you need at a minimum to pay yourself. Now add a row for each of those columns to tally up. Below that line I like to add a “differential”. This is an extra amount that you would like to pay yourself on any given month and you can play around with this number quickly. For example when the holidays arrive and you might need a little more cash, you can throw some numbers around and see if you break even. Next it’s time to start entering the business expenses. Begin entering values and lines for all of your office and business expenses such as gas, internet, phone, truck payments if you own vehicles, credit cards used by the business, equipment payments. Again review those bank statements and try to come up with a number for each type of expense that you have. 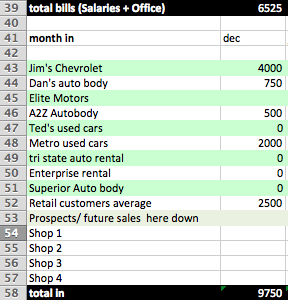 Add a line to tally up each business expense by month. If you have employees or plan on hiring in the future, create a section for them. Each employee will get his or her own line and what you want to do is put in the monthly gross paycheck amount for each month. If it varies, you can either try to guess based on past years performance, or pick a number that you think best reflects the volume your employee will produce. Again this document will be fluid so you can play with these numbers when you are done. Now add a line that tallies these employee salaries by month. 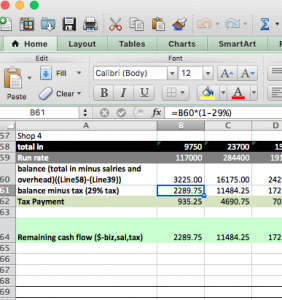 Next create a line to add up your personal expense total, your office expense total and your employee salary total. This is the amount you have to make before taxes. Most mobile repair shops have regular customers such as body shops and dealerships. Start with those first and for each month include the revenue you think you will have from each customer. If you have been in business for at least a year, you can start by entering your revenue from last year. If you have individual non-repeat customers, include lines for them as well and if you want you can come up with an average customer value. Next you will need to create a few formulas. First you want to create a line that totals your office overhead along with any salaries, including your salary differential. Subtract this number from the total sales-in per month, and you have a fairly accurate idea of what revenue is left for taxes. Next take this number and apply the following formula: =B60*(1-29%) In is case B60 is the cell with your remaining net cash after salaries and office expenses. This formula takes your net cash and subtracts 29%, which is a pretty good approximation for a small business tax burden and includes state taxes. We recommend that you speak with your tax professional to figure out what the percentage ito use for your specific situation. Whatever tax rate they suggest simply replace the 29 in that formula with the new number. In the line below this, add the formula =SUM(B60)-(B61). This gives you the monthly tax payment that you will owe (even though you will pay quarterly). In this instance B82 is the net income and B83 is the tax payment. Keep in mind this spreadsheet is designed to give you a quick and pretty accurate picture of your cash flow month by month but it does not factor in things such as depreciations, etc.